The first significant touchpoint of the sales process is often on the phone. With visuals out of the picture, what is it that takes you from an initial conversation to a business win? This study untangles outdated views of what can determine good or bad ‘performance’ in sales and looks specifically at the influence of voice. For a product or service to sell, it has to hold substance, no doubt. But how that substance is conveyed and communicated is what can often create differentiation in a crowded marketplace. And it is the salesperson’s job to create that differentiation. It’s quite like the job of a chef. The same ingredients can be given to five different chefs but the results produced by each could be wildly different, and that is what sets their ‘product’ apart. What are the tools and tactics used by a salesperson to create that distinction? And is it in line with what the buyer feels is important during a negotiation? The voice and delivery of a salesperson is one of the tools they have that can be powerful in steering the direction of an opportunity to do business. Your voice can be used to establish trust, to build confidence and to bring excitement and enthusiasm to a pitch. However, due to it’s subconscious nature, we don’t often realise it’s true influence and can attribute the success of a pitch to other factors. I asked 102 senior executives questions about the sales process to determine where voice can influence the course of a call or face-to-face presentation and where it sits in importance. You can see my findings displayed in the infographic. Below, I will go on to discuss some of the views that I have found to be commonplace around what works in sales performance and reflect on whether those views still hold relevance today. My first assertion is to emphasise the importance of good content and truly understanding that content for effective sales performance. To bring feeling into how you speak, it is important to start by connecting with what the content really means to you. When you understand it, you can be moved by it and then move other people with it. Understanding the content brings confidence into a salesperson’s voice. And when the content is strong, they can tell a story about it, experiment with it and have a base understanding of which tone or style can best represent that content at different points in the process, depending also on the expectations or hesitancies a buyer might bring forward for the salesperson to respond to. With this in mind, I’d like to address a view which exists on the relative importance of content, which is often referred to as the 55/38/7 rule of communication. It is widely referenced in the business world, with the assertion that 55% of communication is visual, 38% is tone of voice and just 7% are the words you say. The rule originally came from the work and findings of Albert Mehrabian, derived from two studies reported in papers published in 1967. After hearing this rule referenced several times and really sitting down to consider its message, I realised that I didn’t personally agree with this finding. Certainly whenever I have been in the position of the buyer, I have never had the luxury of basing only 7% of my business decision on their words or content alone. In fact, I am sure I would have quite quickly ran the business out of money if I had taken this approach. The trouble is many of us, including myself, hear these rules quoted and don’t often go back to the original source to determine their validity or relevance to the context we are applying them in. And then our actions are made based on incorrect assumptions. In the context it was created, the 55/38/7 rule seems very logical. For example, if you were communicating an apology to your partner for a mistake, or a feeling about something, it is likely and plausible that they would focus less on your words and more on your body language, eye contact and tone of voice, perhaps to gauge your level of sincerity in the situation. But try to take the same rule and apply it in a business boardroom and of course it loses its validity and application. 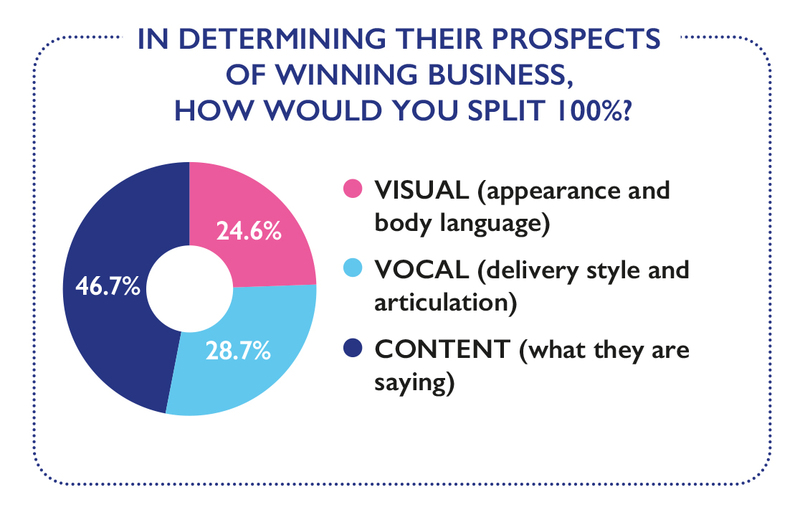 To understand how important each factor is in an actual sales context, I asked my participants to divide 100% between visual, vocal and content in specifically determining a seller’s prospects of winning business during a face-to-face pitch. In line with my predictions, the split was fairly even between visual and vocal, with an overall higher percentage attributed to the importance of content. All three are necessary together, but to give content just 7% in a business context is simply misleading. Content is critical and voicing it with purpose brings you closer to success in sales. This is an idea that originally gained a lot of popularity in traditional retail stores where the idea was to hire visually attractive staff and have them standing at the shop front to draw people inside. Is this still a concept that works in business today? A 2010 study from the University of British Columbia, which looked at physical attractiveness and first impressions, concluded that “people do judge a book by its cover, but a beautiful cover prompts a closer reading.” The study demonstrated that physically attractive people are seen both more positively and more accurately. However, once a ‘closer reading’ takes place, you could argue that other elements become more influential in the making or breaking of that sale, for example through the content or presentation of that content. There are many instances in which you can like what you see visually and you can maintain a positive impression of the person, but you just can’t do business with them because their content didn’t hold up. In other cases, you like how they look and the product they are selling, but there is something in their voice and delivery that doesn’t connect and makes you think twice or decline due to the doubts that raises for you. However, in the instance that someone doesn’t look the part but they deliver substance through their content and they have the voice and delivery to match up with it, I can confidently say the sale will still have a strong chance of being made. In other words, good looks may be a benefit but they are not a deal breaker. Voice and delivery is. And so is the content. This was evidenced in the study too. Voice and delivery was nearly equal in weighting with the nature of the query, in its contribution to the buyer’s impression of the seller on a call. Voice and delivery was nearly twice as important as the company being called from and more than four times more significant than job title. 38% of participants chose voice and delivery as the most influential factor in helping a seller build rapport with them and 79% of participants said that strong voice and delivery would buy a cold caller more time on the phone with them. With a lot of business being initiated on the phone or by email, the visual has very little opportunity to influence at the early stages of the sales process. So by the time you have reached the stage of a meeting in person, a good level of interest and buy in is likely to have already been established, deeming the visuals less important in that early impression. Then once you reach the face-to-face pitch, as established by the results of my study above, it is the content that takes precedence and visual and vocal influences are relatively even. My study demonstrated very clearly that nature of query and voice and delivery are the two significantly more important factors to achieve progression in the sales process, over company and job title. Several participants went on to point out that, with so many startups in the market, the name of the company can often be unheard of and the key instead is a proposition that is convenient and communicated clearly. Many participants further argued that fancy job titles have started to lose the weight they once carried, as more and more startups emerge and give high-flying titles to individuals who don’t always carry the level of experience traditionally held by someone titled with that level of seniority. Given that job titles are now frequently used in negotiations with managers as a cheaper way of offering someone a promotion, their validity has been put under serious scrutiny. It is worth questioning how much weight they carry in the mind of the person occupying the title versus the role that title has in actually altering a buyer’s perception. Only 17% of participants found it to be important in forming their initial impression of a seller, but 0% went on to say that it was significant in building rapport. Credentials are another interesting area. When a seller can demonstrate that their client list consists of credible, established businesses, this can often provide the buyer with a good level of reassurance that the seller will be able to deliver a good quality product or service. Why? Because the buyer often assumes that these other businesses would have done their due diligence and made a positive assessment of the seller before taking them on. Therefore, they perceive their risk to be minimised to an extent. The reality can often, however, be different because one size does not fit all. There can be a whole host of reasons, unknown to the buyer, for which a quoted client may have brought the seller onboard and they may not be the factors that suit that particular buyer’s business model and requirements. So credentials can sometimes be a surface-level part of the picture. How many times during a pitch has the seller gotten to the section on their company credentials on a slideshow and you, as the buyer, just want them to move on and get to the point of whether they can really solve your problem in a way that is convenient and affordable for your business? Making sure your content carries substance and then using your voice and delivery to present that in a way that is articulate is key in winning trust and business from a potential buyer. I do believe credentials are important, but they can also build an expectation in one’s mind of how that person will present themselves, based on the credentials they carry. If they can’t then support those credentials in person, it is worth asking how far they can really carry a seller. I chose to raise these three points because belief in these ideas can create many misconceptions about where to place your focus when you are preparing to win business. And I do believe we can, more often than not, waste valuable time on the superficial and forget to address what is subconscious but influential – someone’s voice, their body language, their manner. The superficial can create an initial impression but it is for the latter to go on and prove it because they influence a buyer’s feeling and instinct. Voice can be a personal thing and when you aren’t used to feeding back on it openly in a corporate environment, the result can be that we fall into avoidance and don’t acknowledge the potential it can carry to influence the sales process. If you have sat back as a buyer before and observed a pitch, you can probably relate to being able to forgive a gap in someone’s content or understanding, but if you find an issue with how they come across, it’s more difficult for you to overcome. As a seller, you have a lot more control over your voice and delivery than you may think. The key is to be aware of it, to acknowledge it and to start experimenting. I can say, with certainty, that the influence it will have over your pipeline when used effectively will not go unnoticed.